PHILADELPHIA (AP) — On paper, it looked like a mismatch. 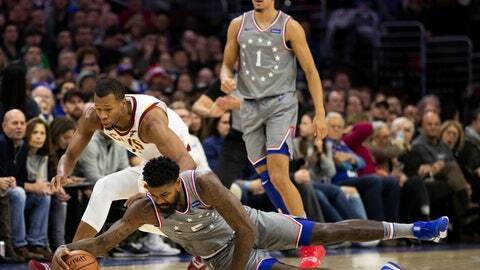 The Cavaliers didn’t view their game against the 76ers that way and it showed. Joel Embiid had 24 points and 12 rebounds for Philadelphia, which had won four in a row overall and 20 consecutive contests at home dating to last season. The 76ers’ last home loss came last March 13, a 101-98 defeat to Indiana. Philadelphia was booed by a large contingent of the sold-out crowd late in the contest. The Cavaliers slowly extended their one-point lead to start the fourth. Cleveland took leads of seven, eight, nine — on Harrison’s 3 — and 11 before increasing it to 12 on Clarkson’s 3 from the right wing with 3:50 left. The advantage eventually grew to 15 points on Clarkson’s layup with 1:48 when the outcome was no longer in doubt. The 76ers took their largest lead on Simmons’ layup that made it 79-74 with 2:53 left in the third quarter. The Cavaliers finished the period by scoring 10 of the final 14 points to enter the fourth up 84-83. Philadelphia came out sluggish to start the contest, and the Cavaliers took advantage by scoring the first seven points and growing their lead to 22-8 on Sexton’s jumper with 4:08 remaining in the first. Cavaliers: Cleveland played its second game without J.R. Smith since Tuesday’s announcement that the Cavaliers sent home the veteran guard, who has requested a trade. … G George Hill (sprained right shoulder) missed his seventh straight contest. 76ers: Philadelphia’s record for consecutive home victories is 24, set during its 1983 championship season from Nov. 27, 1982-March 23, 1983. … G Markelle Fultz missed his second straight game following his agent’s announcement on Tuesday that Fultz wouldn’t practice or play until having his right shoulder examined. Fultz, who sat on the 76ers bench, is scheduled to see a specialist on Monday in New York. … Philadelphia native and former middleweight boxing champion Bernard Hopkins sat courtside. Cavaliers: Host Houston on Saturday night.